This entry was posted in Sault Ste Marie and tagged Passenger, Prototype, Sault Ste Marie, Wordless Wednesday by Chris van der Heide. Bookmark the permalink. Yep, taken at the corner of Bruce and Bay Streets, at the old ACR station (just out of the frame of this photo at right). The handsome three-story red sandstone structure (now a credit union) at this intersection was the old ACR station and office building. 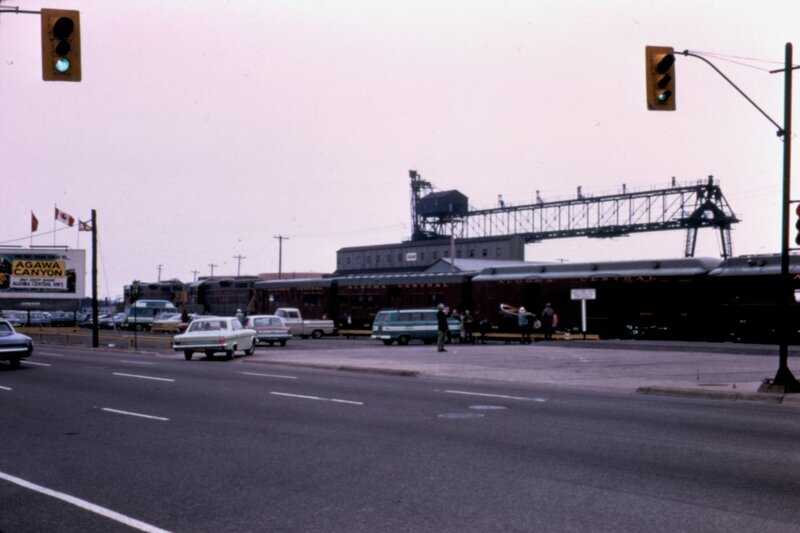 The old coal dock with the unloading bridge structure in the background is where the Delta Hotel is now. The Station Tower would be to the left of the image. I will have to dig out the slide and check the date on the mount later. Pulled the slide out, the date written on it is July 4, 1969. Photo by R.J. Schwenk. Another reference indicates the unloading bridge at the coal dock visible in the background was pulled down a year later in May 1970. Another set of photos from 1972 in this collection shows part of the mall under construction in the background behind some cars photographed at the station.